Coffee Mate Original Creamer Packets in a bulk 1000 count box. Great quality product, at a great bulk rate value price. This is sure to keep your coffee just right, and the individually sealed packets keep your Coffee-Mate creamer in it's freshest state. Believe us when we tell you, all creamers aren't created equal. Coffeemate Original powder creamer is better because of the manufacturing process. 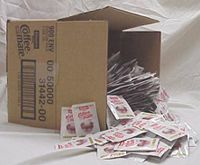 Contains 1000 individually sealed Coffee-Mate Powder Creamer Packets.